Yes, I know the Rose Bowl game was practically a week ago. But after a couple days in the car and a couple more organizing my life before winter term begins, this is all I could muster for a recap of my wonderful four-day SoCal stint. 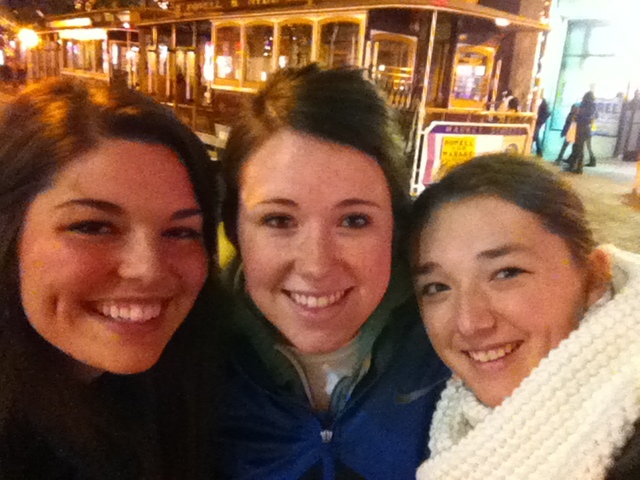 I drove down with two great friends – Lauren and Lindsay – and we made a pit stop in San Francisco to ring in 2012. Yep, we're those people who hold our arms out to take pictures of ourselves. Please note the cable car in the background - we were DEFINITELY in San Francisco. 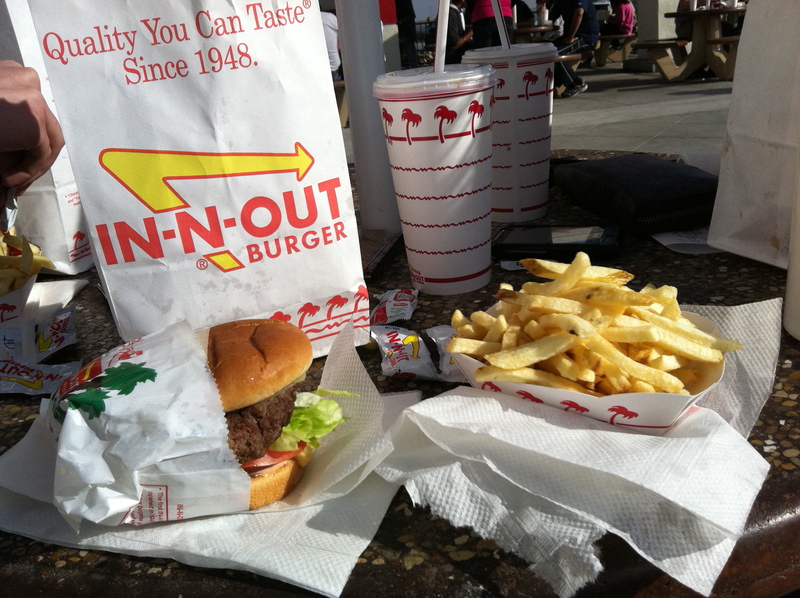 We spent our New Year’s Day on I-5, and I feel pretty good about my year knowing that the first lunch I ate in 2012 was an In-N-Out Burger. 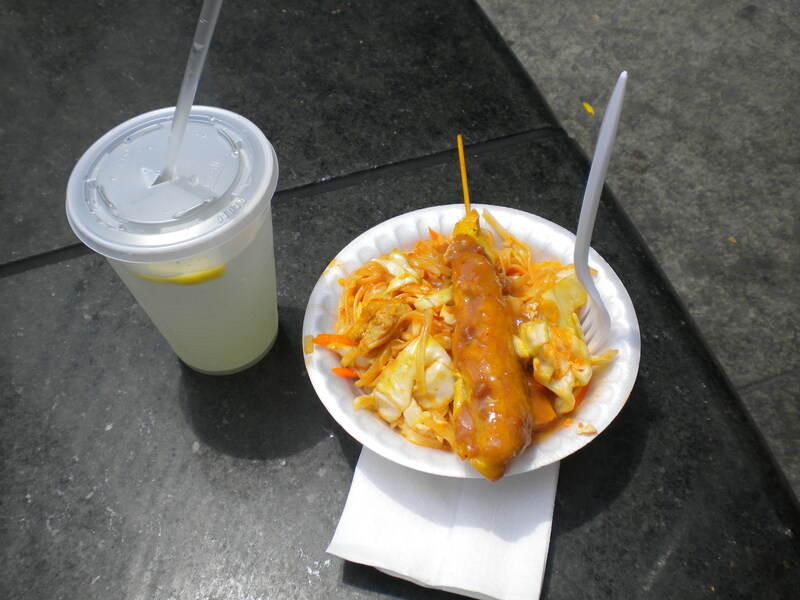 Because an Oregonian can't come here and not take a picture of her meal. It was an incredibly smooth journey that carried us all the way to the Hilton at LAX, the Ducks’ team hotel. There were designated ticket pick-up hours, and a line was already forming when we arrived. As we waited, my usual bout of ticket anxiety kicked in. Did I really get one? Yes, I’ve been receiving the Azumano Travel emails. But did I remember to buy a second one? Yes, I distinctly remember listing my dad as Lauren’s emergency contact so I could submit the form as quickly as possible. Do I have my student ID card? It never hurts to look again. Yes, it’s there. This always happens to me at Autzen. The student ticket distribution system is so touchy that, even with guaranteed student season tickets, I’d get nervous every time I neared the turnstiles. But my fears were unfounded, and two gorgeous tickets waited for me in a crisp envelope. 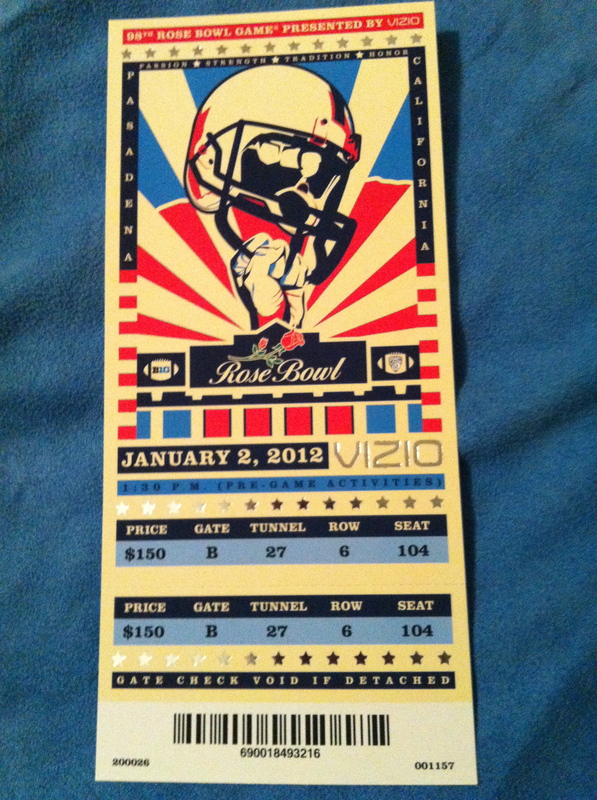 The coolest sporting event ticket I've ever possessed, even if it is a rip-off of the Obama "HOPE" design. We went from the Hilton back up to Santa Clarita, where we’d be staying with the family of an old housemate (who has since married and moved permanently to Eugene). I’d met Jeff and Anne a couple times before, but we didn’t know them all that well and they were incredibly kind and gracious to us. Monday came: Gameday. We navigated public transportation to Pasadena, which was surprisingly easy. As we exited the Metrolink train we rode from Santa Clarita to downtown LA, the train operator issued the usual warning to remember your personal belongings but added, “and no offense to anyone, but go Oregon.” We cheered. There’s really nothing I can say about the game that hasn’t already been said. All I have to add is how excited I am to know that I was there. Even in the excitement of the moment, we acknowledged that this was a game for the ages. 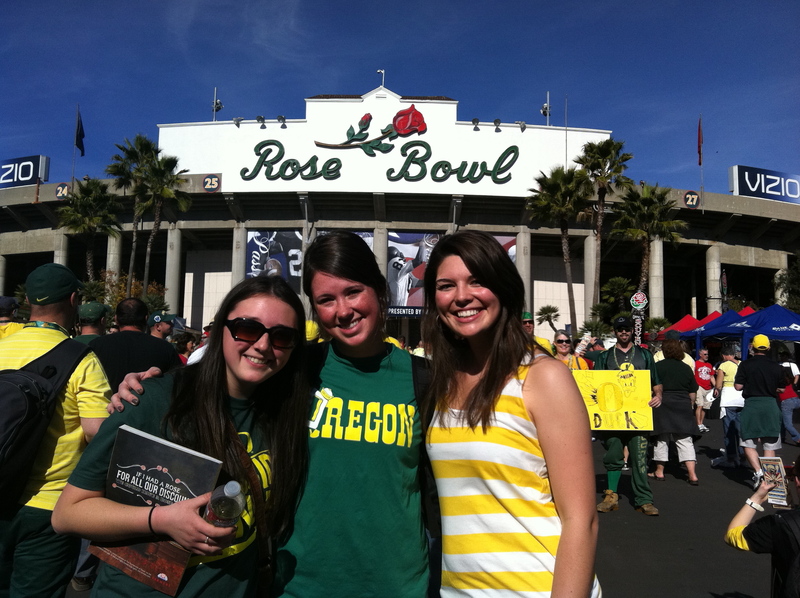 When DAT’s 91-yard run is played on the Autzen jumbotron years from now, I can tell my kids, “I was there! I saw that!” That fumble recovery? I was there! Heck, I bet I’ll even drop that line with regards to Montee Ball (who, despite Wisconsin’s loss, is a beast). If there was any way to experience your final Oregon football game as an actual Oregon student, this was it. BCS redemption. California sunshine. History made on a number of fronts. Geez, it’s fun to be a Duck. The view of the field from our end zone seats (unfortunately, we didn't have the luxury of depth perception). 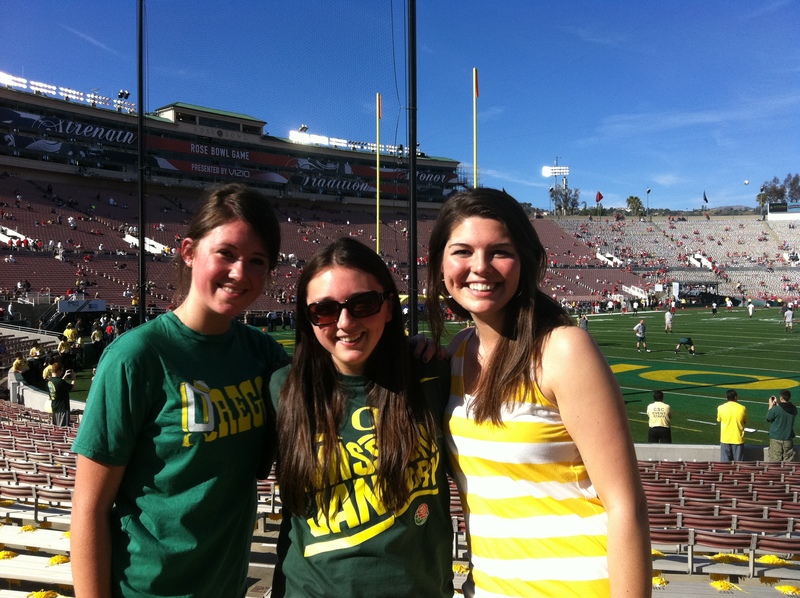 The classic Rose Bowl trip photo. 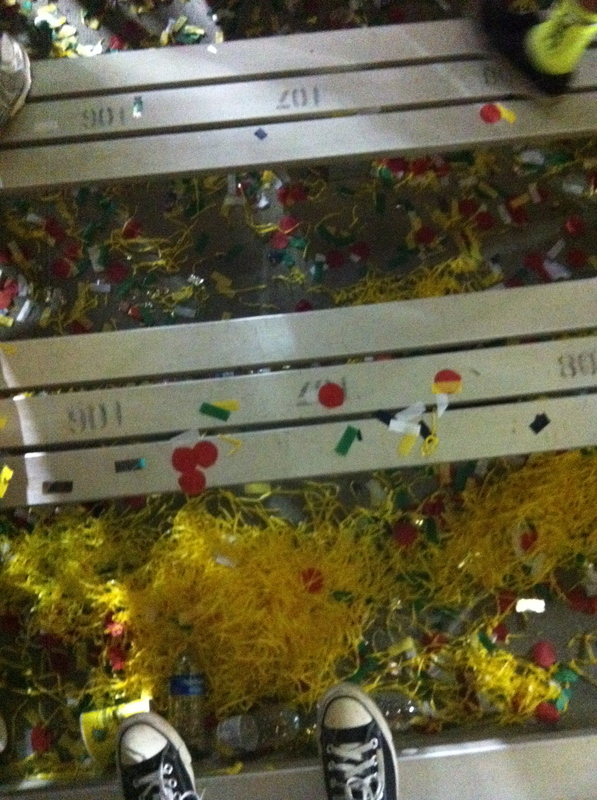 My Converse stand among a post-win sea of confetti and pom-poms. We left early Saturday morning, and it was pretty darn cold. So cold, we couldn’t get the doors of Lauren’s Ford Escape to open. We poured water over the openings and yanked on the trunk door. Then we realized the doors were locked. The concierge at our hotel in San Francisco warned us to layer up before we headed into the city for NYE. “Everyone says it’s freezing,” she said. Knowing that San Francisco can be chilly, we ran back to fetch our coats. Then proceeded to peel off layer after layer as we walked through town – apparently that city is warmer in December than June. Before we left, I called LA’s MTA and mapped out a pretty legit route to the stadium. Jeff, one of our hosts, told us about the faster Metrolink train we could take downtown, but none of us thought about the return trip. When we arrived downtown after the game, we learned that the day’s service to Santa Clarita had ended…meaning we were stranded. Jeff and Anne get a gold star in heaven for driving to North Hollywood and picking up our helpless trio. The hardest part of being a college football fan is enduring the endless Chick-fil-A ads, after it was mercilessly removed from Oregon several years ago. (I love Chick-fil-A, but Lindsay, whose family hails from Georgia, is an even bigger fan.) 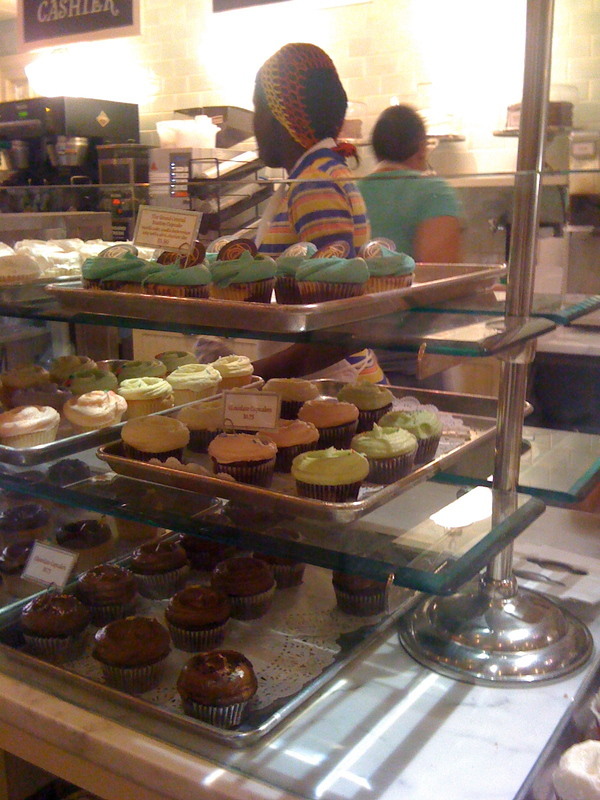 Thankfully they still exist in LA, so we were able to get our fix. We stayed in Redding on the way home, and as we walked out of the hotel, a CHP officer was walking in. Noticing our Oregon attire, the first thing out of his mouth: “Have fun in Pasadena?” Even the fruit inspection people at the California border asked us if we were headed for the game. Oh, one final thought. If you’re looking for a classy but not-too-expensive place to dine in LA, head for Bottega Louie. My roommate at the UO is from the area, and she and her mom treated us to a fabulous lunch on Tuesday, complete with mini desserts. Aside from major family meals like Thanksgiving and Christmas, I don’t know the last time I’ve seen so much quality food on one table. 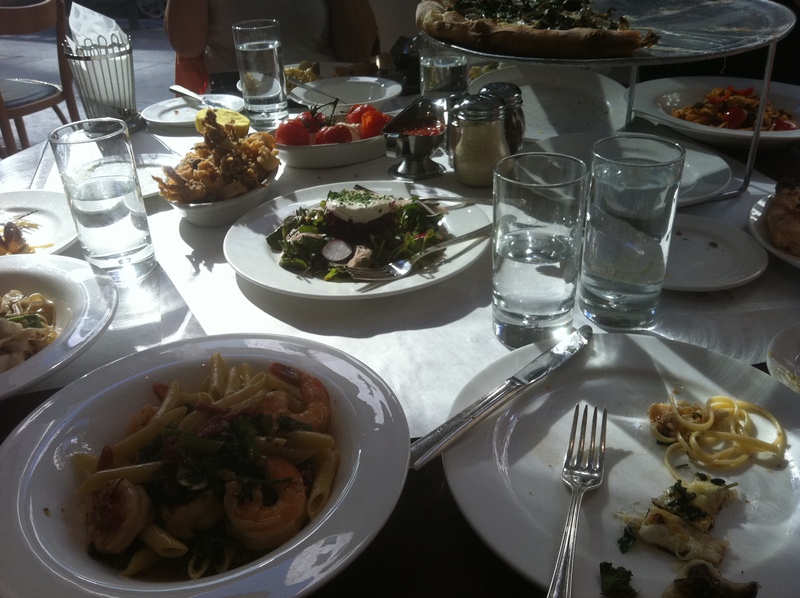 Pastas and pizza galore, fried calamari, caprese, asparagus, some sort of delicious beet dish. Food coma. Coffee, of course. 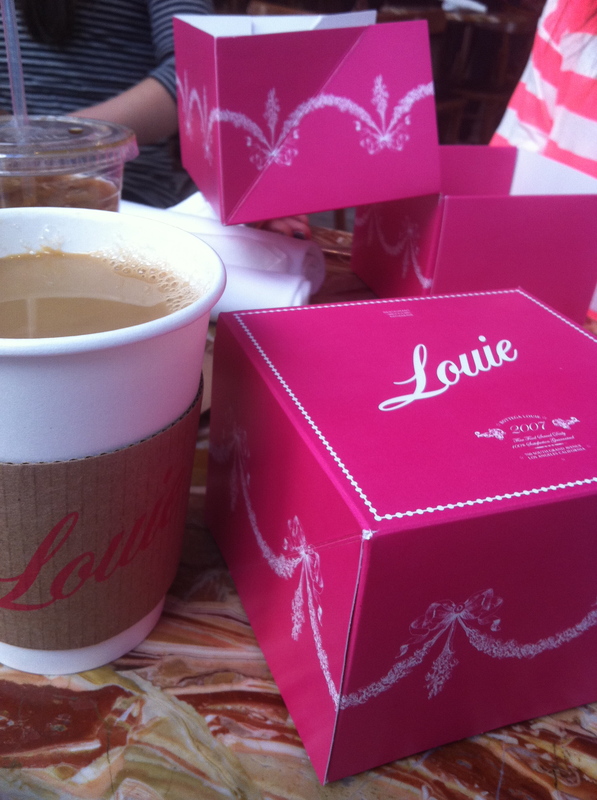 And the most beautiful take-out boxes known to mankind. 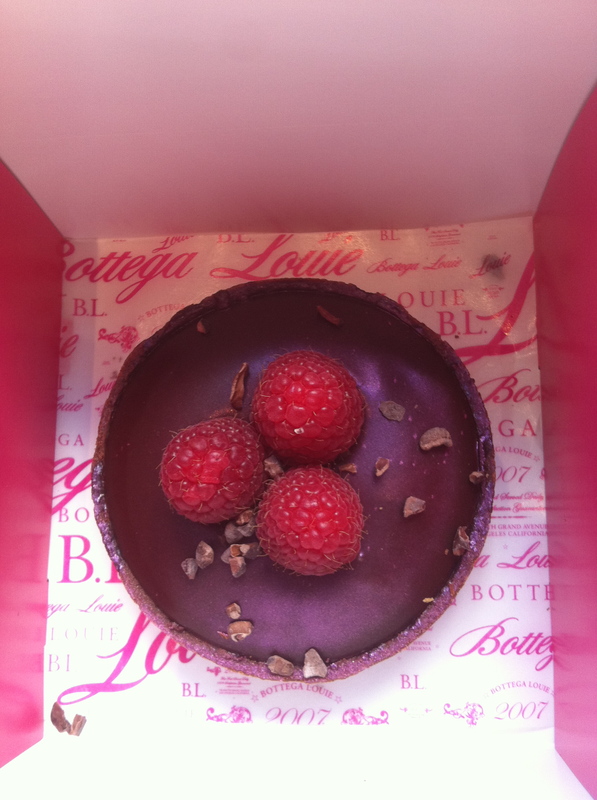 I have a bunch of other pictures – most notably, of Bottega Louie’s insane macaroon trees – but you get the idea. Amazing restaurant, great company. (And drinking iced coffee in January.) One of the greatest afternoons on record. A dark, rainy winter is ahead, but I feel lucky to have had four days in the sun with my friends and my Ducks. There is a running joke in my family that all of my clearest memories in life are tied to the foods I was eating during important events. While this may or may not be true (decide for yourself), it is true that I love food. 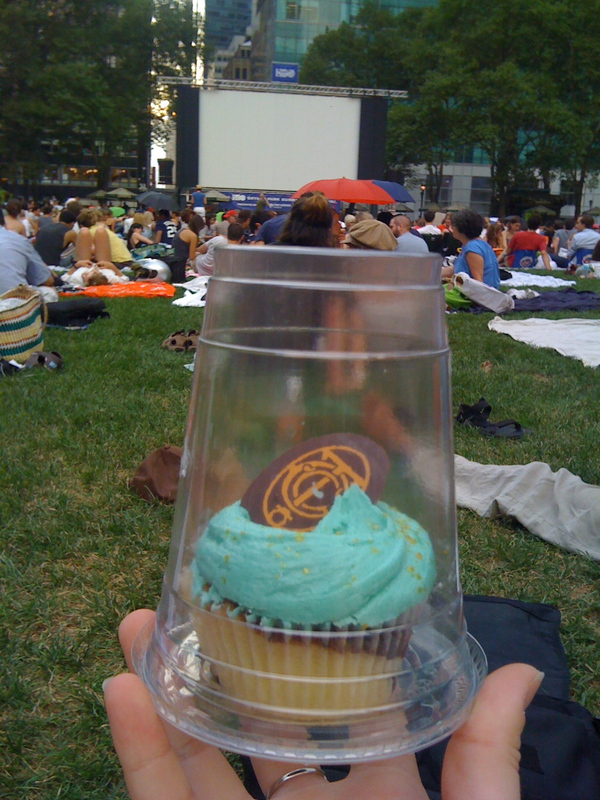 The Grand Central Cupcake, kept in one of Magnolia's genius upside-down plastic cup containers. S’mac is short for Sarita’s Macaroni and Cheese, and “most amazing random food restaurant ever.” At S’MAC, you can choose from a bunch of different mac & cheese combos and then have it served to you on a skillet. I recommend the “Garden Lite” – mac & cheese with lite cheddar, parmesan, roasted cauliflower and portobello mushrooms, roasted garlic, broccoli and scallions. Of course, that’s all I’ve tried, but it was pretty dang good. 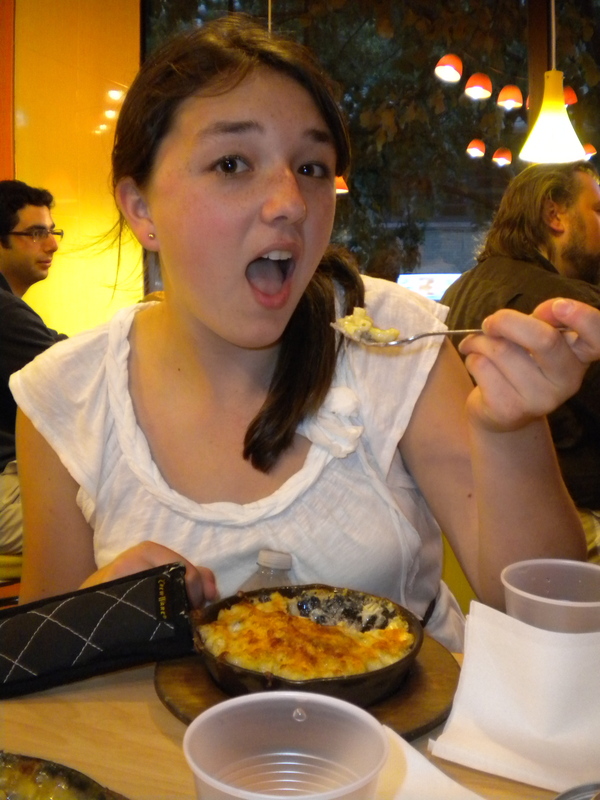 Ignore the fact that I look really tired, and focus on the amazingness of that mac & cheese. Lombardi’s Pizza in NoLita (North of Little Italy) – can’t go wrong in a restaurant where you only pay $8 for two enormous pizza slices AND where they play Frank Sinatra music. To me, a discussion of food isn’t complete without a little homage to my hero Liz Lemon, who loves food just as much as I do. So, while it really has nothing to do with anything I’ve said above, take 30 seconds to appreciate Liz and her food obsession. As always, thanks for reading! Well, the first week at Rodale is done! So far, it’s been wonderful. I have already begun real public relations work and work with some cool people. Making the transition from student life to working world is difficult to say the least, but I’m getting there. 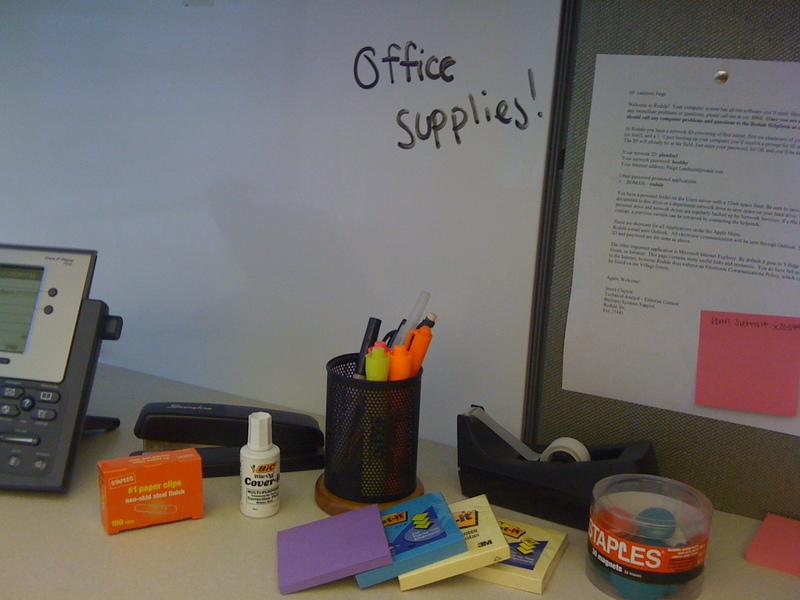 Okay, so not real heaven, but it was as close to heaven as you can get: the Rodale office supply closet. On Friday morning, I got to go “shopping” for office supplies to keep at my desk. I may as well have been a kid in a candy store looking at all of those staplers, binders, paper clips, folders and Sharpies in one place. With dry erase markers, I can now utilize my white board! Another cool trip I got to take was to the Museum of Arts and Design, where an exhibit called “Bespoke” is currently on display. The exhibit features some pretty amazing custom-designed bicycles. You couldn’t take pictures, but the detail that went into creating those bikes was obvious. I went with two other PR people from Rodale because the museum was hosting a panel discussion that night about bikes as a form of urban transportation and the editor of Bicycling magazine (a Rodale publication that I’m doing a lot of PR work for) was moderating. 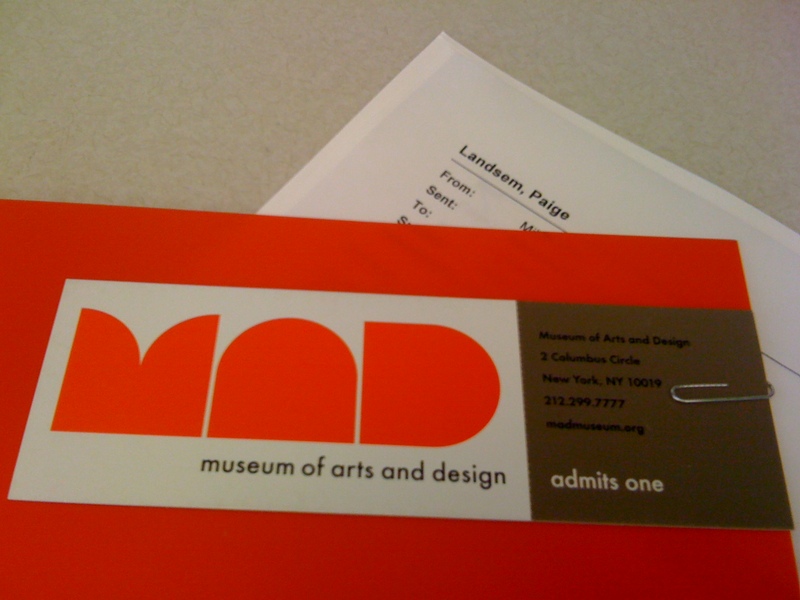 My admission ticket for the Museum of Arts and Design; please note the very official-looking "Landsem, Paige" e-mail printout above the ticket. The combination of being in a huge new city and starting a (semi) real job forces you to learn a lot of lessons right off the bat. A lot of these lessons could have been learned the easy way if I had just sucked it up and whipped out a map; I am trying so hard to be one of the locals, who always knows where she is going. But, I’m not a local and I don’t know where I’m going. So, I get lost. I go the wrong way on the subway. More than once this week, I was forced to stop and ask for directions and be the helpless idiot from out of town who can’t find her MTA subway card buried in her wallet. Thankfully, I haven’t made any really bad mistakes that have permanently damaged my pride or reputation (although I did write “devise” where I meant to write “device”, which was pretty embarrassing). But, I have learned that it’s important to take a step back and remember that you still have a lot to learn – and plenty of time in which to learn. You don’t have to be a local or a smart PR person right away. You just have to be humble and willing to learn. If you haven’t been to New York City, Duane Reade is the convenience store on every corner. It’s basically Rite-Aid or Walgreens, only it’s called Duane Reade. I can honestly say that I have purchased something at Duane Reade every day so far except for Friday. That may be sad, but it’s the truth. And aside from Duane Reade, I’ve also had dates with some other local restaurants; it’s been fun exploring the lunch spots around the Rodale office. While I’ll start bringing my lunch to work, I’ve been able to try out a deli right next to the office, a great little Japanese/bento place in the building and a nice Italian restaurant just a few blocks away. All were great – now it’s just a matter of keeping myself away from Five Guys Burgers and Fries down the street. That’s about it for now. I’ll leave you with this picture of the top of the Chrysler Building at night, which, while taken with a lame cell phone camera picture, is still kind of cool. 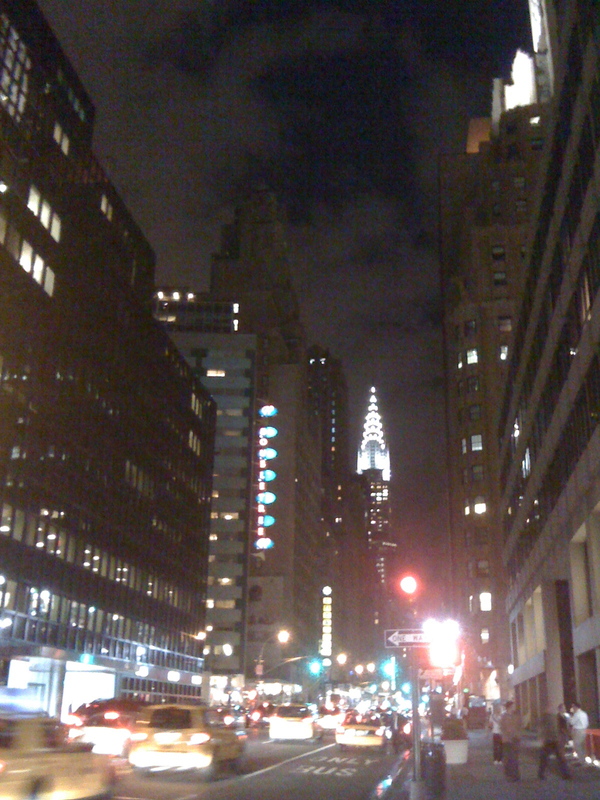 The Chrysler Building at night, along with the steady stream of cabs. One of the most influential musicians of the last fifty years paired with a bubblegum-pop boy band? What? That is how I felt when I saw Boomer Esiason as a judge on the Food Network’s “Iron Chef” last night. What? Is he selling out? Just having fun? This is obviously not earth-shattering news, but just something I found confusing/amusing. As if seeing one of my musical heroes paired with a barely tolerable band isn’t enough, I have to see Boomer on the Food Network. It’s weird seeing a football player/analyst discussing the texture and taste of pig brains (seriously). “Iron Chef” judges always seem so holier-than-thou, discussing the blending of different flavors and rattling off the names of strange ingredients, so it surprised me to see Boomer talking the gourmet language. At present, there is no image to accompany Boomer’s Food Network appearance, but I’m on the lookout. On a more relevant note, iTunes 9 has been downloaded on this here MacBook. And it’s pretty dang awesome. Steve Jobs has done it again. The “Genius” feature in iTunes 8 was pretty cool, but I never became a regular user. However, iTunes 9 gives us “Genius Mixes.” With Mixes, iTunes generates groups of mixes that are basically personal Pandora channels. It presents you with twelve channels of music that are grouped together based on genre, artist, etc. As I write, I’m listening to the “Rock” channel (actually, 6 of the channels were dubbed “Rock”: Rock, Rock 2, etc., but they’re all unique). If you like Pandora, you’ll like Genius Mixes. Right now, I’d even say I like it better, because I’m more familiar with all of the songs and I can skip as many as I like. At the time of this screen cap, I was enjoying the R&B/Soul Mix; feeding my Motown obsession. Have you downloaded iTunes 9? What do you think of the changes? (There are also some new features regarding shared libraries and iTunes store layout.) Also, if you’ve tried the Genius Mixes feature, I’d be interested in hearing about what mixes it generated for you and whether or not you enjoyed those mixes. Also, as you already know, it’s September 11. One of those days that’s permanently burned on your brain, one of those days that becomes one of the defining moments in a nation’s history. I’d like to take this space to honor those who lost their lives on that day, and to thank those who work to preserve our freedom today. I’ll know I’ll never understand the depth of your sacrifice, so thank you.